Today started at six o’clock in the morning with a quick weather check and then a few hours sitting at the top of a lighthouse counting birds. What a view. Want to see it? Click on the picture below to open a virtual reality view to take a look. 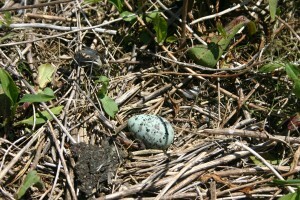 We also spent some time taking a look at some of the nests on the island. 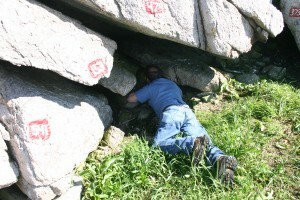 We need to keeptrack of how many active burrows there are so we know how they are doing this year. How do you find the nests? 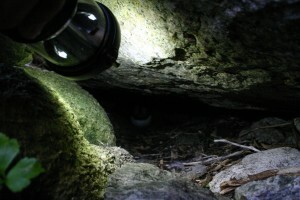 Matinicus Rock is a bird colony without any trees, so birds nest here on the ground. 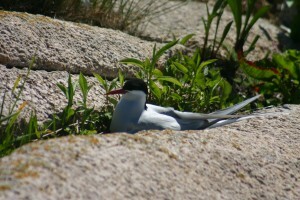 Some birds, like arctic terns, nest on the rocks or in the grass near the rocks. 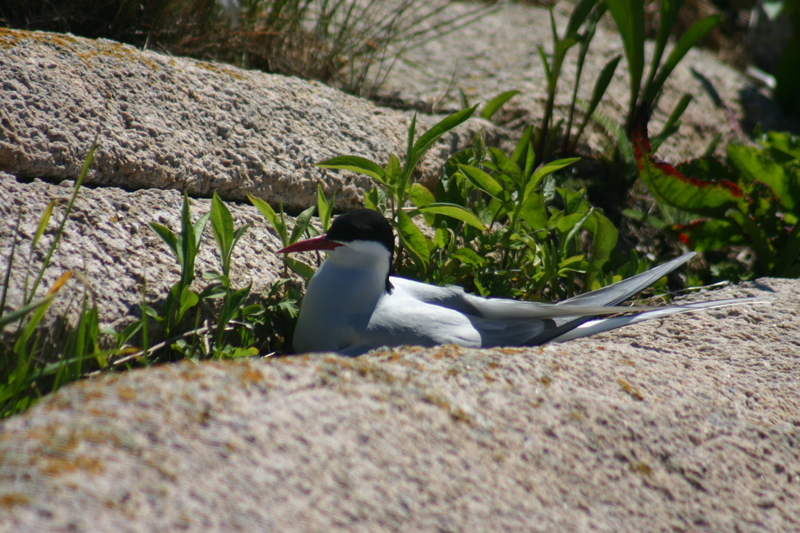 Here is a view of a tern sitting on her nest. 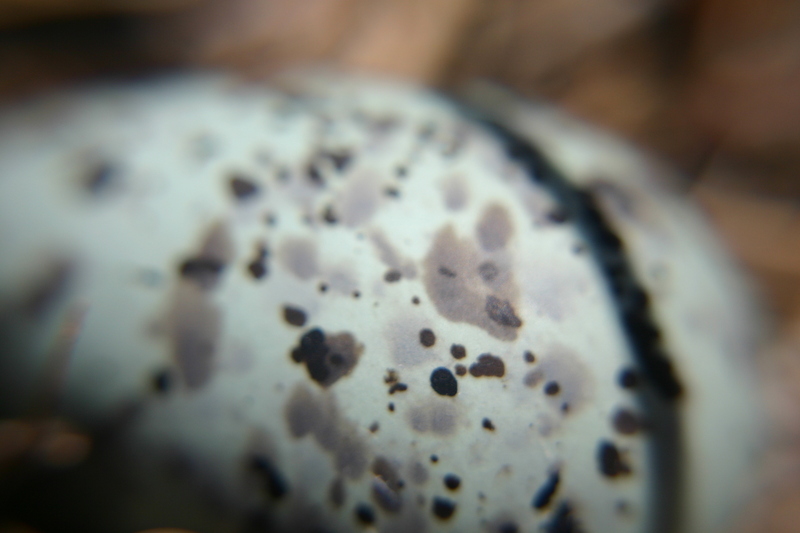 The photos below are the eggs themselves. inside. Can you see the puffin sitting on her eggs? Thanks for your answers to yesterday’s question. “The Rock” is .49 miles long and .2 miles wide. The closest mainland is about 17 miles away. Puffins and other sea-birds nest this far out for a few reasons. One is to avoid some land predictors, such as foxes, owl and mink, which are not out here this far. In additon, people now live along the coast, so the amount of area that the Puffins can occupy on the mainland is much smaller. Finally, they are much closer to the deep-water fish that they prefer to eat. How deep can puffins swim? How many fish can they hold in their beak? If you have to wear sunscreen, should birds wear sunscreen too? If not, what protects them from the sun? Is there someone looking through the camera lens while you talk to the camera? Or do you just set it up and talk to it as if there was someone there? 2. They can keep about 10 in there beak. 3. Puffins can stay underwater for about a minute but usually it lasts for 20 to 30 seconds. 4. Puffins mostly eat fish. 5. How far can a puffin fly and how long can they stay up? Do they eat fish in the air? Puffins can dive to 200 feet. A puffin can hold about 10 fish. Puffins can hold their breath for 20 to 30 seconds. Puffins eat sand eel and any other small fish it can get. How can puffins go so deep in the water? Puffins can swim deep this is how many feet they can swim 200 feet. They can hold ten fish in their mouth at a time. Puffins eat fish and meat. They can hold their breath till 30 to 20 seconds. Can puffins eat other animals? Puffins can hold 62 fish in there mouth. Puffins can hold there breath for 20 sec. puffins can swim down to 200 feet. Puffins can hold their breath for 20 seconds. Puffins can hold 62 fishes in their beak at once. Puffins can swim 200ft under the water. 1. They can dive 200 feet. 2. They can hold ten at a time. 3. They can hold there breath for 20 seconds to 30 seconds. 4. They eat fish and meat. 5. How do they keep all of those fishes in there mouth . How come it does not fall out of there mouths. 1. Puffins can swim 200 feet in one dive! 2. The average fish can carry 10 fish in one catch. 3. Puffins can dive up to a minute but most dives usually last 20 to 30 seconds. 4. Adult puffins eat small fish such as sand eels, herring and hake. 1. A puffin can dive up to 200 feet in one dive. 2. A puffin can hold 10 fish in their mouth. 3. A puffin can hold their breath for 20 to 30 seconds. 4. A puffin can eat fish and meat. What do you think about the island can you sleep with that noise. How do puffins keep all of those fish in their mouth how doesn’t fall out of there mouth when they go to pick up the other puffin? Puffins can swim 200 ft deep. Puffins can fit 10 fish in there mouth. Puffins can hold there breath for 30 seconds. Puffins eat sand eels, and Earring. Are puffins related to pengiuns? 1. They swim 200 feet deep. 2. They can hold about 10 fish is their beek. 3. They can hold their breath from 20-30 seconds. 5. How long do puffins live? 2. The average puffin can carry 10 fish at once in their beak. 3. A puffin can stay underwater for a minute but most dives last 20 to 30 seconds. 4. Puffins eat small fish such as sand eels, herring, hake and capelin. 5. Do puffins fight over fish, when the other puffin wants it? They eat mainly small fish. They can swim 200 feet. They can hold 10 fish. They can hold there breath for 20 to 30 seconds. how many fish can they eat at one time and do they eat the fish underwater? 4. Puffins eat fish called cod, sand laces, whiting, and haddock! 1. They can swim down to 200 feet. 2. Puffins can hold10 fish. 3.They can hold they’re breath up to 20 to 30 seconds. 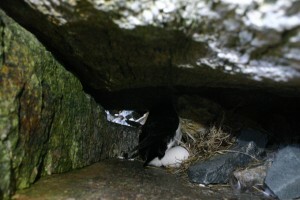 How many eggs can Puffins lay? 5. How many eggs do they lay at once? 1. Puffins can swim 70 meters deep (200 ft). 2. Puffins can keep about 10 fish in their beaks. 3. Puffins can hold their breath up to 30 seconds. 4. Puffins mostly eat small fish. 5. Do puffins fly with fish in their mouth? •	A Puffin usually eat small fishes, and sand eels. •	How can puffins swim under water with fishes in its beak? How many puffins are on the island. Is it hard to sleep with all the noise? 1) Puffins can dive to around 200 feet. 2) Puffins can hold around 10 fish in their beak at once. 3) Puffins can hold their breath for 20 to 30 seconds. 4) Puffins eat cod, sand lances, whiting, haddock, and zooplankton. 5) Do puffins squawk all night? Puffins can hold 63 fish in their beak at once. Puffins can swim 200ft under water. Puffins mainly eat fish. They also eat eels and herring. Do you like puffins? Can you touch them? •	Puffins can swim up to 200 feet deep. •	Puffins can put up to 10 fish in their mouth at once. •	Puffins can hold their breath for a minute but usually 20 to 30 seconds. •	Adult puffins mostly eat small fish, such as sand eels, herring, hake and capelin. •	Why do they blow the fog horn? •	How can you tell if it is a female Puffin or a male Puffin? Puffins can swim up to 70 meters in depth. A puffin usually carries 10 fish per trip, but the record is 62. A puffin can hold its breath for a minute, but the trips underwater they usually hold it for 30 to 20 seconds. Is the fog horn annoying when you are trying to sleep? 1. Puffins can swim 200 feet deep. 2. Puffins can hold 10 fish in their beak at a time the record is 62 fish. 3. Puffins can hold their breath for up to one minute. 4. Puffins eat mostly small fish such as sand eels, herring hake, and capelins. 5. How many puffins have you seen? Who built the lighthouse? How do you sleep with all the noise? The puffin can go up to 200 ft. deep. Puffins can hold about 30 fish in their beaks. A puffin can hold their breath for 20 – 30 seconds. Puffins eat small fish and crustaceans but they prefer fish more than crustaceans. Mr. T., How and why do the puffins come back to the same place they were born in every year to lay their eggs? •	Puffins can swim 300 feet deep. •	Puffins can hold 10 fish in their beak at once. •	Puffins can hold their breath up to 1 minute. •	Some adult puffins eat fish. •	How many puffins are their in the world? how many have you seen? Puffins can swim up to 200 feet. Puffins can hold there breath for a minute. Puffins eat small fish for example sand eels. Puffins can hold up to 62 fish in there beak. How many eggs does one female puffin lay? What animal eats the puffin? How long does it take for a puffin egg take to hatch? Are their babies on the island yet? Puffins can hold about 10 fish in there mouth . A puffin can dive to 300 feet .a puffin can hold there breath for around 20 minutes. adult puffins eat mostly small fish such as sand eels, herring, hake and capelin. Who discovered the island? How many fish have you seen in a puffins mouth? 3. They can stay under water 20-30 seconds. 1. They can go under 200 feet. 2. They can hold up to 62 fish in there beak. 4. They eat small fish and small eels. Puffins can swim 200 feet deep. Puffins can hold their breath for a minute long. Puffins eat small fish such as sand eels and herring. Puffins can hold up to 62 fish in their beak. How long does the mother puffin stay with its baby before it is old enough to take care of itself? Do puffins eat anything other than fish? How many puffins did you see so far on Matinicus Rock? 1. Puffins can swim 200 ft under water. 2. Puffins can hold about 10 fish in their mouth, but sometimes the puffin can hold 62 fish in their mouth. 3. A puffin can hold their breath up to 1 minute. 5. How do you sleep? Do you have a special place to sleep? Do the puffins and the fog horn keep you awake? Mr.T how fast can a puffin fly. Puffins eat small fish such as eels and herring. The Puffin can carry an average of ten fish per catch. Puffins can hold there breath under water for 20 to 30 minutes. They can dive 100 feet down into the water. What are the daily habits of the Puffin. The average catch is around 10 fish per trip but the record in Maine is a whopping 62 fish at once! Adult puffins mostly eat small fish, such as sand eels, herring, hake and capelin. They can dive over 100 feet down into the water in order catch fish, and can hold up to 12 fish in their beaks as they swim. What other birds are they related to? 1. I know they can swim 100 ft deep. 2. I know puffins can hold 10 fish in there beak. 3. I know they can hold there breath for half a minute. 4. I know they eat sand eels, herring, hake, fish and capelin. 5. Do you know the life cycle of a puffin? A their any orphaned puffins? Does another puffin raise it or do scientists ever raise baby puffins? 2. The average catch is about 10 per trip but the record is 62 fish at once. 3. A puffin can dive for up to a minute but most dives usually last 20 to 30 seconds. 1. They can dive over 100 feet down into the water. 4. Adult puffins mostly eat small fish, such as sand eels, herring, hake and capelin. 5. Is it legal to touch a puffin? Will the mother puffin go back to feeding it if a human touches it? 1. Puffins can hold about ten per trip. 3. A puffin can dive for up to a minute but most dives usually last 20 to 30 seconds. 4. They can dive over 100 feet down into the water. 5. If another puffin gets lost does another mom “adopt” it? Adult puffins mostly eat small fish, such as sand eels, herring, hake and capelin. Puffin diets vary from colony to colony because of the variety of fish around the breeding islands. During winter puffins may also eat crustaceans, but their preferred food is fish. Puffins can carry several fish back to their nest at a time. The average catch is around 10 fish per trip but the record in Maine is a whopping 62 fish at once! A puffin can dive for up to a minute but most dives usually last 20 to 30 seconds. They can dive over 100 feet down into the water. How many eggs do adult Puffins lay at once? 1. Puffins can swim about a 100 feet deep. 2. Puffins can fit about 10 fish in there mouth but there record is 62 fish. 5. Is it illegal to have a puffin as a pet. 1. Puffins can swim 100 feet deep. 2. The average amount of fish that puffins can hold in their mouth is 10 fish per trip but the record in Maine was a whooping 62 at once! 3. Puffins can hold their breath under water for a half a minute. 4. Puffins eat small fish such as sand eels, herring, hake and capelin. 5. How long do puffins need to lay on their eggs? If the climate is getting warmer there do the puffins need to sit on their eggs as long or do the eggs hatch sooner? 1. They can dive 100 feet down in the water. 2. The average amount is 10 but in Maine it is 63!!! 3. Puffin can usually go underwater for about 20 to 30 seconds at a time. 4. Adult fish eat animals like small fish, sand eels, herring, hake, and capelin. 5. What season is when puffin mate? Adult puffins mostly eat small fish, such as sand eels, herring, hake and capelin. Puffin diets vary from colony to colony because of the variety of fish around the breeding islands. During winter puffins may also eat crustaceans, but their preferred food is fish. Puffins can carry several fish back to their nest at a time. The average catch is around 10 fish per trip but the record in Maine is a whopping 62 fish at once! They can dive over 100 feet down into the water. A puffin can dive for up to a minute but most dives usually last 20 to 30 seconds. Where do puffins lay there eggs? Puffins can carry about 10 fish in their beak but the record is up to 62 fish at once!!! Puffins can hold their breath up to 20 to 30 sec. Puffins eat small fish mostly sand eels, herring, hake and capelin. Puffins can swim up to 200. Have you ever scene a puffin hatch out of its egg???????? Do they have feathers right from the beginning? Can you take a picture of a newborn chick? Hi! These are my answers for your Questions. 1. Puffins can swim for about 1 minute but usually for 20-30 seconds. 2. Puffins can hold an average of 10 fish in 1 catch. 3. Puffins can hold their breath for about 1 minute but usually for 20-30 seconds. 4. Most of the time they eat small fish. What are some things that you will always remember about Mantinicus rock and the Puffins? Puffins can carry about 10 fish in their beak but the record is up to 62 fish at once!!!! Puffins can hold their breath up to 20 or 30 seconds. Puffins eat fish, sand eels, and capelin. Puffins can dive up to 200 feet. Have you ever seen a mother feed its baby? Do the dad puffins fee the chicks? 1. The average catch is about 10 fish per trip the record is a jaw dropping 62 fish! 2. Puffins can swim about 100 feet deep in the water! 3. A Puffin can last up to 20 to 30 seconds under water. 4. Adult Puffins eat small fish, such as sand eels, herring, hake and capelin. 5. Are puffins in danger? What is the average3 amount of fish you have seen in a puffins mouth? What is the most you have seen so far in their mouth? 1. Puffins can approximately swim as deep as 200 ft. This equals to about 70 miles. 2. Puffins can hold about a dozen or more fish in their beak. 3. Puffins can hold their breath up to about a minute. 4. Usually puffins eat fish like herring, sprats, sand eels, zooplanktons, crustaceans, and mollusks. 1. Puffins can swim 100 feet deep in the water. 2. The puffin can hold 10 fish in its mouth. 3. A puffin can stay underwater from a range of 20 to 30 seconds. 5. Are puffins endangerd in Maine. Puffins can swim 100 ft deep. Puffins can hold 10 fish at once. Puffins can hold there breath up to 1 minute underwater. Have you ever felt a puffin? And if you have are they soft? 2- They can hold up to 12 fish in there beak at once. World record is 62 fish where puffin in main did that feat. 3- They can hold breath for about 20-30 seconds underwater. 4- Puffins eat small fish such as… eels, herring, hake and capelin. 5- Is it cold hot or average weather there? Have you banded a puffin yet? If so how many? 1.Puffins can swim 200 feet deep. 2.The highest amount of fish held in a puffin’s beak is 62 (average is 10). 4.Puffins eat small fish like eels, herring, hake and capelin. It depends on the area they live in. 5.Why are you involved with Project Puffin? 5. Are puffins related to the penguin family? 1. Puffins can swim up to 100 ft. deep into water. 2. Puffins can hold up to 12 fish in there beak. 3. Puffins can stay under water from 20 to 30 seconds. 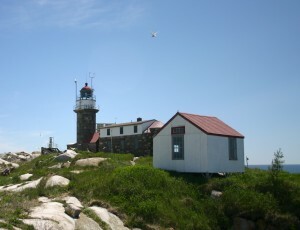 5.	do you like watching puffin’s in Maine? 1. They can swim 100 feet deep. 2. They can hold about 10-12 fish in their beak. 3. They can hold their breath up to 20- 30 seconds. 4. They eat eels, herring, hake and capelin. 5. Is it always loud there? 5. How loud do puffin’s squeal? 1) Puffins can dive down more then 100 feet. 2) Puffins can carry 12 fish in their beak while they are swimming. 3) Puffins mostly eat fish. In the winter they eat crustaceans. 4) Puffins can hold there breath for about 20 to 30 seconds. 5) Have you tried to put a tag on a puffins leg? If yes was it hard? 5 why do puffins have black and white feathers? 1. Puffins can swim over 100 feet deep. 2. Puffins can hold up to 12 fish in their beaks. 3. A puffin can hold its breath for up to 1 minute but usually 20 to 30 seconds. 4. Adult puffins mostly eat small fish, such as sand eels, herring, hake and capelin, also eat crustaceans but prefer fish. 5. If puffins are in the water 90% of their life where do they sleep? Unless the extra 10% of there life on land is where they sleep. 1 Puffins can swim 100 feet deep to catch fish. 2 Puffins can hold about 12 fish in their beak. 3 Puffins can hold their breath for up to a minute. 4 Puffins eat small fish such as eel or herring. 5 How do Puffins stay warm when the water is frozen? They can dive over 100 ft deep. The average can catch 10 but in Maine a whooping 62. It can stay under water for 1 minute. Have you put a leg band on a puffin. Puffins can hold 12 fish in their beaks. Puffins mostly eat small fish, such as sand eels, herring, hake and capelin. How many puffins did you see? 1. Puffins can swim 100 feet down in the water. 3. Puffins can last under water 20 to 30 seconds. 4. Puffins eat mostly small fish like sand eels. 5. How many puffins are there on the rock? Have you caught any and put a leg band on them. 1. Puffins can dive 100 feet in the water. 2. Puffins can fit 12 fish in their mouth. 3. Puffins can go 1 min underwater. 4. Puffins’ small fish, sand eels, hake and capelin. a 1 in 1,000,000 chance it will get you. Doesthe colror of the sky change evry day. I think so many birds live together because maybe they need to reproduce and let the babies remember there birth place. One advantage to living together is you can fight the predators together. Also, one disadvantage is that it can get to crowded. How do you know if you see a male or female puffin? I think birds nest together because They would have no room. And they would have no peace and quiet. The advantages are you can’t argue and you get to look at nature. I think so many birds from different species nest together because if they stay together all the time they will always have someone to keep their babies safe from predators. One disadvantage is if no one looks out for predators most of your babies will be eaten. Are how loud a Razorbill dad is when he calls his babies. 1. do the baby chicks know how to fly when they are born or do they learn? 2. Do the puffins only eat fish or more food? 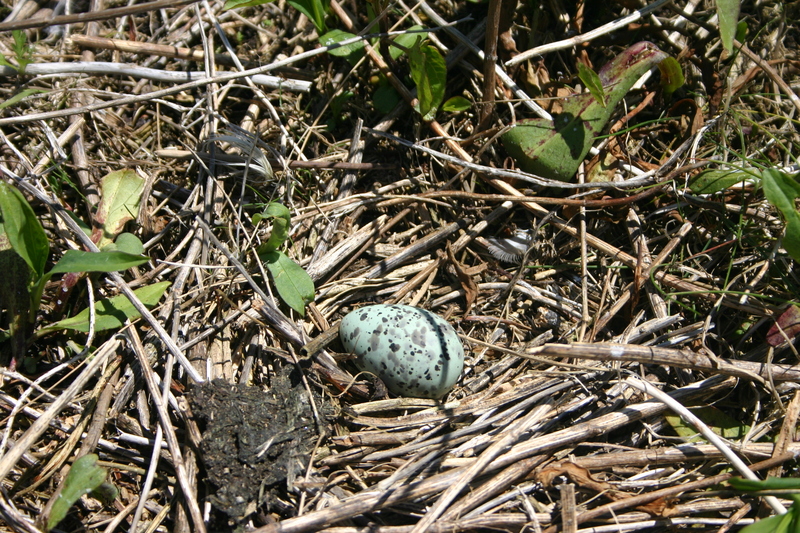 Do any of the other birds on the island feed on puffin eggs? 4. eat small fish, such as sand eels, herring, hake and capelin.